Here's How The International Space Station Is Celebrating Thanksgiving : The Two-Way Astronauts at the International Space Station are planning to spend Thanksgiving in quite a traditional fashion: There will be a turkey dinner with all the trimmings, good company, and football. NASA astronaut Shane Kimbrough shows a pouch of turkey he will be preparing for his crew in celebration of the Thanksgiving holiday, aboard the International Space Station. "It's going to be little bit different for us up here in space, but I'm going to try to make it as much like home as we can," he says. Turkey, packed in a pouch. "We'll heat this up and it'll taste really good, just like you're having at home," Kimbrough says. A side dish of candied yams. Cornbread dressing, which they will rehydrate before serving: "And it will taste really good, I'm sure." Green beans and mushrooms: "Can't have a Thanksgiving meal without some green beans." Sweet tea with lemon drink mix: Kimbrough says that as an Atlanta native, sweet tea is a must. Cherry-blueberry cobbler: "So that's going to be awesome." Joining him at dinner will be fellow U.S. astronaut Peggy Whitson, a French astronaut and three cosmonauts from Russia. "We're obviously going to be talking about what Thanksgiving means to us, what we're thankful for, and sharing the tradition with our French and Russian colleagues," Kimbrough adds. Mission Control has also agreed to transmit some live football games "to complete the experience of Thanksgiving," he adds. Along with organizing a traditional holiday celebration for his crew, Kimbrough recently managed to take part in another important U.S. tradition: voting. 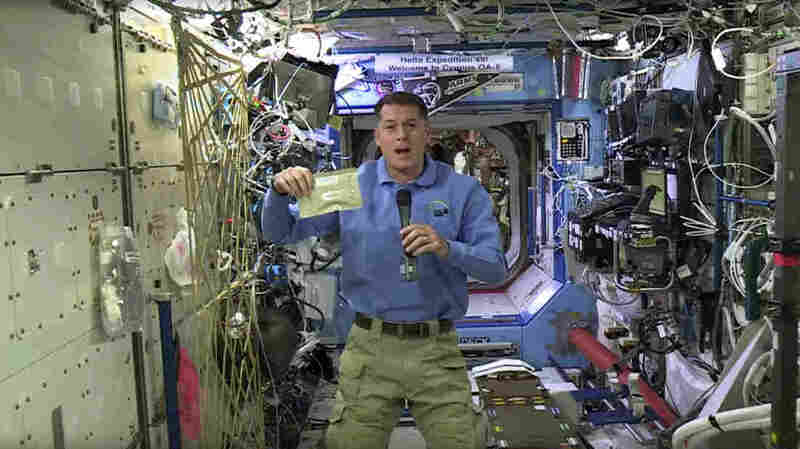 As NPR reported, he cast an absentee ballot in the U.S. presidential election from space, thanks to a Texas law that allows astronauts to vote in Houston.